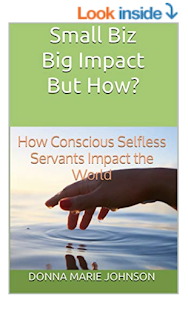 How Conscious Selfless Servants Impact the World"
"Quiet time alone in prayer, in Bible study, and in quiet Holy Spirit-led reflection are daily rituals that empower leaders to develop Christ-focused vision aligned with this truth [of humble servant leadership]." Small Biz Big Impact But How? Being a Queen is a Responsibility more than a Privilege. Plant the seed for your transformation. Emerge from trauma, anxiety and grief.